Lucky Club Casino is celebrating the launch of their new Three Stooges slot game with a casino bonus up to $222. The new game, Three Stooges: Disorder in the Court" is based on the classic comedy flic and features the zany trio Larry, Curly and Moe. 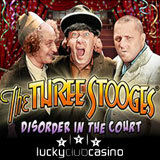 The Three Stooges: Disorder in the Court from NuWorks has Auto Nudge to give extra chances at winning combinations. If the wild Larry, Curly and Moe symbols land just above or below the reel, after pay out they’ll nudge into place and cover their entire reel. Getting all three stooges at once triggers 9 free spins. Collecting Stooges during the free spins can win up to 333X the triggering bet. “The animations are fun and this new Auto Nudge feature has been paying out really well for me so far,” said one player testing the game last week. Lucky Club is one of just a few casinos offering unique games from Nuworks. It recently added instant-play versions of its most popular games including Martian Mania.